Born July 31, 1885, in Peoria, Illinois, Raymond Albert "Speck" Wheeler graduated fifth in the Military Academy class of 1911 and was commissioned in the Corps of Engineers. He served with the Veracruz Expedition in 1914 and went to France with the divisional 4th Engineers in 1918. He was awarded a Silver Star for actions in the Aisne-Marne campaign and by the end of World War I had assumed command of his regiment with the rank of colonel. Between the two world wars he served as district engineer in Newport, Rhode Island; Wilmington, North Carolina; and Rock Island, Illinois. 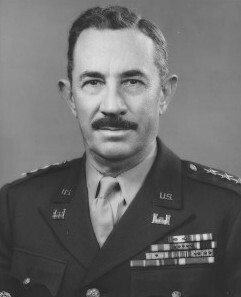 In September 1941 he was appointed chief of the U.S. Military Iranian Mission and in February 1942 was transferred to the China-Burma-India Theater as Commanding General of the Services of Supply. In October 1943 he was assigned to Lord Mountbatten's Southeast Asia Command as principal administrative officer and Deputy Supreme Commander. Before the end of World War II, he became Commander of the India-Burma Theater. He represented the United States at the Japanese surrender in Singapore. Appointed Chief of the Corps. of Engineers in late 1945, Wheeler initiated construction of the Missouri River dams projected in the Pick-Sloan Plan. Wheeler's U.S. Army decorations include the Distinguished Service Medal with two Oak Leaf Clusters and the Legion of Merit. He was also made an honorary knight of the British Empire. He died February 8, 1974, in Washington, D.C.